So how did the course workout for you? I’m considering signing up for it and would love to hear your insights. I really enjoyed it! Dr. Emlet is one of my favorite teachers at CCEF. It has helped me in my Bible reading and how I approached it. Thanks. What would you reccomendation be, I have the option of biblical interpretation or helping relationships. Problem is, I will have to wait till next spring to take biblical interpretation. In your view, would you take helping relationships or biblical interpretation first? I took Helping Relationships years ago when Paul Tripp taught it. It depends if you are going for one of the certificates. I believe you have a certain amount of time to take all the classes that quality for a certificate. If that is the case, I would take the only the classes that pertain to a particular certificate and then move on to the next set of classes (this is what I have been doing). Both are great classes. 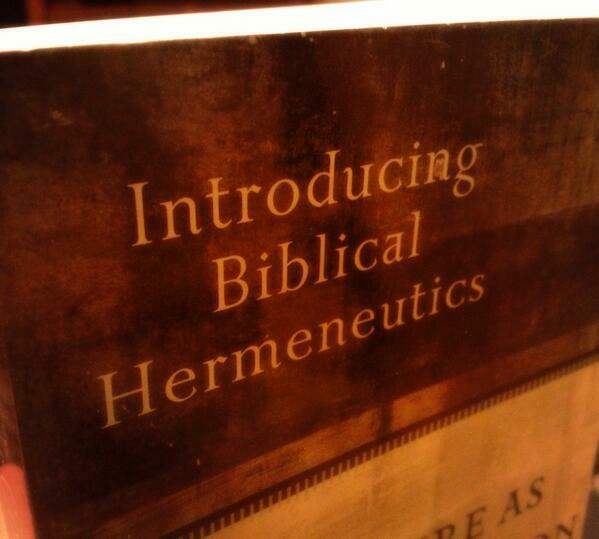 Biblical Interpretation felt like more of a stand alone class that can be taken at any time. Helping relationships appears to go with the flow some of the earlier classes I took (like Dynamics of Biblical Change). Hope this helps! Great thank you. Does biblical interpretation cover quite a bit on how to approach people? I’m excited about both courses. I’ve taken dynamics and human personality, but feel like I want to have an understanding of how to applyscripture, as well as understanding the person. Sorry for asking so much.